We have free NFL predictions and ATS picks for every game on the board this conference championship Sunday of the NFL Playoffs. Using our proprietary formula, we provide predicted scores for both the AFC and NFC Championship Games. We’re down to the NFL Final Four in the race to the Super Bowl. This weekend’s two winners will head to Atlanta and faceoff for the Lombardi Trophy at Super Bowl 53. We correctly predicted the winner of all four divisional playoff games. Our winning season continues as our data driven NFL predictions are 171-91-2 (65%) straight up picking winners and 136-110-18 (55%) beating the spread on every game this NFL season! Two games this Sunday to decide who squares off in Atlanta at Super Bowl 53. The top two seeds in each conference will battle for the conference championship this Sunday. Both games are rematches of regular season games. In the AFC Championship Game, the Kansas City Chiefs host the New England Patriots at Arrowhead Stadium. This is a rematch of week 6 where the Patriots won at home 43-40 over the Chiefs. The NFC features the top seed New Orleans Saints against the Los Angeles Rams. The Saint hosted the Rams in week 9 besting them 45-35. 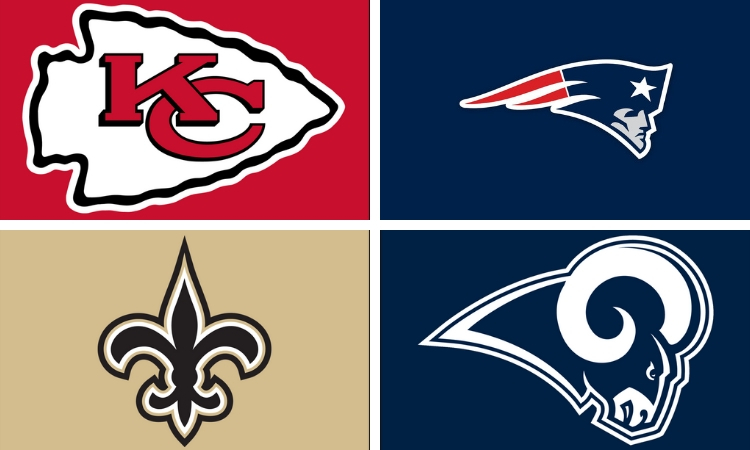 Get our data driven free NFL wildcard playoff predictions for Kansas City Chiefs vs. New England Patriots and New Orleans Saints vs. Los Angeles Rams on Sunday, January 20, 2018. It’s going to be the Kansas City Chiefs vs. New Orleans Saints at Super Bowl 53! Get data driven NFL predictions through the Super Bowl! Buy our premium NFL picks in the Pick Shop! See our latest NFL Power Rankings.